There is 50 gallons of clean, soft water on board. A 5 gallon hot water tank, keeps the water warm and comfortable. A super sudser system is used which circulates about 2 gallons of water and shampoo over and over the coat, getting the coat and entire dog super clean. That system is to the left of Koda in the photo. The hose on the right carries the fresh water to the tub. The water mixer, just barely visible above Koda, is used to adjust the water to a comfortable temperature. Depending on the coat and color of your pet, numerous shampooings and different types of shampoo are utilized. We use top brand shampoos, Nature's Specialties, Bio-Groom and Davis. We use Detangling, Smelly Pet, Groom'n Fresh, Bio-Groom (for a itchy and flaky skin condition), Super White (for white coats), Bronze Luster (for apricot and tan coats, Black Coat and Flea & Tick (when needed) shampoos. We also have Furminator and conditioner which helps eliminates shedding and Peppermint Twist shampoo during the holidays. The face, head, muzzle and ears are shampooed using tearless shampoo. After the coat is clean, the super sudser is again utilized, this time with Luxury Remoisturizer Conditioner, leaving the skin moist and the coat soft. Koda was shampooed 3 times, using Detangling, Super White and Groom'n Fresh shampoo and conditioned once using Groom'n Fresh Conditioner. 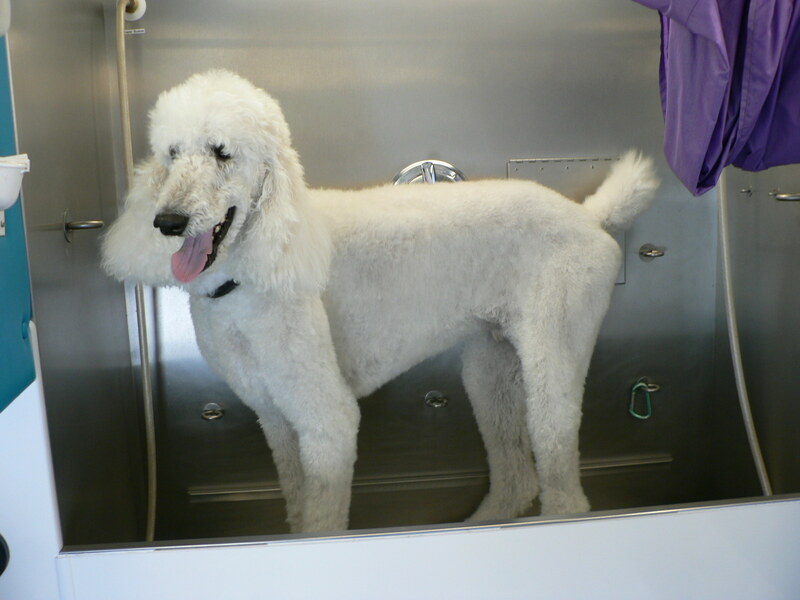 The drying process takes place in the tub as you see Koda after his bath and blow dry. Prices subject to change. Please call to get more information on pricing.